New king on the mountain: Titus’s son, Kuryama, is now the leader of the “Beetsme” group. The Gorilla King steps down from his kingdom. When the phone rang and I heard someone from The Gorilla Fund on the line, I got all excited. I knew it would be an update about Titus, the gorilla featured in The Gorilla King, a Nature show that I worked on that aired last April (2008). 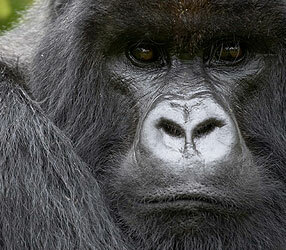 When last we left him, Titus’s son, Kuryama, had gained alliance and support from most of the gorillas in Titus’s group. Kuryama became their leader and left with them, leaving the massive silverback to form his own group from those that remained loyal to him. Perhaps it was Titus’s age that helped him decide to reunite with Kuryama’s group. It is harder and harder for Titus to protect and lead his group. At 33 years old, he is considered an old man by gorilla standards. The amazing thing is that Titus, who lead the “Beetsme” group for 15 years, decided to be second in command to his son, Kuryama. Family is such a strong and important part of gorilla life, I am happy to see that even with his new role, Titus is still garnering respect and attention from all in Kuryama’s group as well. To learn more, read the story at the Gorilla Fund Web site.